When my children were young, there were days when all I wanted was for them to cooperate with my demands. As I grew in my knowledge of children, I began to understand that cooperation is a character trait that must be learned. Cooperation is the opposite of selfishness and is based on mutual respect. In 2013, Time Magazine's front cover was "The Me, Me, Me Generation." To counter a "me mentality" in your family, you should strive to teach your child cooperation skills at a young age and seek an early learning school near you that instills these values. One of the best ways to do this is by having your child help you with chores beginning around 2 years of age. The process of teaching cooperation begins by adults displaying cooperation and highlighting the mutual benefits through casual conversation. For example, as you see two people working together, say something like the following: "Daddy was cooperating with your brother, and together they folded the towels quickly. Look at the smile on your brother's face because your daddy was so helpful. Now the floor is cleaned up, so your daddy doesn't trip." 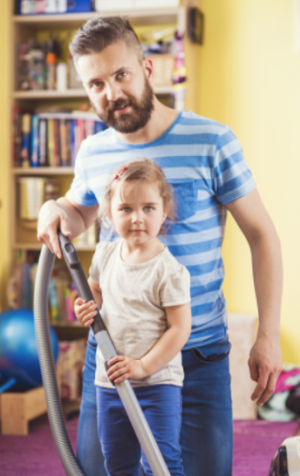 These are specific steps to teaching children to do chores that nurture cooperation: explain the "rules" or steps, problem solve prior to starting to thwart any roadblocks, brainstorm ways to do the chore, ask for ideas and give choices on how to accomplish the task, provide positive comments on the mutual benefits of the cooperative chore. As children get older and gain skills, they can be given their own age-appropriate chores. As with any character trait, modeling is one of the best ways to teach your children to be cooperative - at home and at their local childcare center. "Learning to cooperate means that a person can think about and balance their own needs and wants with another person's needs and wants. Many people think that cooperation means that the child does what the adults want. That is not the case. True cooperation is give and take between people that ends up with something they both agree on." Children's Lighthouse staff is dedicated to teaching children how to cooperate with those around them and in our local childcare centers. Cooperation has direct ties with our proprietary Lighthouse C.A.R.E.S.℠ curriculum and is our Character Value for the month of September.